From the beginning, Guinean Master Drummer Famoudou Konaté’s near 50-year career as a professional musician has been marked by milestones. According to village lore, this legendary drummer was too small to carry his own djembe to the site of the festivals in the village of Sanbarala when he first began soloing, so the women dancers had to transport it for him. When the Guinean National Ballet (Les Ballets Africains) was formed by President Sekou Toure in 1958, Konaté became First Soloist for this troupe, which quickly rose to international acclaim, and Konaté maintained his position for the duration of his 26-year career with the ballet. In the mid-1980s, Konaté was one of the first Guinean drummers to establish himself as a teacher and performer throughout Europe. In 1996, he was awarded an honorary title by the Academy of Arts in Berlin, and became the first African musician to hold a seat at an academic institution in Germany. Another milestone was cast recently when, in July 2000, Famoudou Konaté, along with 30-plus hand-carved bass drums, descended on the University of Chicago campus to offer workshops in traditional Malinke drumming. The success and popularity of Malinke drumming, spawned to a large degree by the efforts of Mamady Keita and Tam Tam Mandingue in the United States, may well have been elevated to another level by Konaté’s unique blend of storytelling, song, dance, and teaching. The four-day, intensive event included instruction on all five of the instruments that comprise the traditional Malinke orchestra: lead and accompanying djembes, and the three bass drums called doundounba, sangban, and kenkeni. The event organizers believe that this immersion in the songs, stories, dances, and rhythms of the Malinke, billed as a “mini-camp,” may well have set a new standard for djembe instruction in the United States. The following interviews, broadcast by various Berlin radio stations on the occasion of Konaté’s appointment to an honorary professorship in 1996 at the Academy of Arts in Berlin, offer a glimpse into the thoughts and insights of this legendary Master Drummer and pedagogue. Announcer: The name Famoudou Konaté probably doesn’t mean much for most of our listeners. In his home in Guinea, West Africa, though, Konaté is a famous and respected man who enjoys a great deal of recognition as a drummer. But the West African music business is a bit different from ours. There, one has a name and that is all—something that would only on very rare occasions be considered enough to secure a professorship at an accredited music academy. Luckily, though, Famoudou Konaté is one of those rare exceptions. Since the beginning of this semester, this drum virtuoso from Africa is an honorary professor at the Academy of Fine Arts, and as such he is the first and only African musician ever to have held such a title at a German university. In the last few years, Konaté has offered several drum workshops here in Berlin, and it was students who participated in them who said, “We want him as a professor,” and it worked. So now we have traditional African music not merely as a concert event in the House of World Cultures or as a seminar for ethnomusicologists, but rather African music as a perfectly legitimate component of the musical education here. Interviewer: Mr. Konaté, you are the first African musician to become a professor at a German university. Are you proud of this honor or does it unleash mixed feelings? Famoudou Konaté: Honestly and from the bottom of my heart, I am very, very proud of this. Why? I started playing the typical djembe music when I was just a small child. I toured the whole world with les Ballets Africains de Guinee, the Guinean national ballet, and still, I never received a degree. But I was known throughout the world as a good drummer, and the people liked my music. Still, I had no degree. Then I came to Germany and to the Academy of Fine Arts, where a friend of mine acted on my behalf to get officials at the Academy of Fine Arts to offer me a degree. On the day I received my degree, I didn’t sleep a wink; that’s how deeply moved I was. Interviewer: You are one of the most prominent musicians in all of West Africa. Your career began as a drummer in your village. How do you become a “village drummer” and what function does this position have in Guinea where you are from? Konaté: Take me, for example. I was a farmer. I was raised as a farmer. Back where I was born, I came into the world in order to work the fields so that we would have food to eat, or to slaughter animals that could be eaten. But I always heard music. My brother played djembe. I was born into an environment where I played the drum in all sorts of everyday situations. This is how musicians are made in Africa. You don’t go to school, you don’t study. You just listen incessantly. Interviewer: In the traditional context of your home country, is the musician a highly regarded person or more a fringe figure in society? Konaté: A musician is respected, truly respected, and if he is a good player, he is very popular and that happens very quickly. You are constantly asked to play because you are good. You are invited again and again to play, but the problem lies in the payment for the musician because he does not get a lot of money. That is related to the overall situation in my country. This country has very little money. The people would like to pay the musician what he is worth, but they simply don’t have the means to do so. Interviewer: I would say that you can’t really talk about Guinea and the musical tradition you represent without discussing the country itself just a little bit. Guinea is, after all, one of the poorest countries in the world today, and at the same time it is infinitely rich in natural resources. How is that? Announcer: At this point, Konaté comes to a halt mid-sentence—obviously, it’s hard for him to talk about monetary difficulties. It isn’t until much later that he explains how, after 26 years of collaboration with the Ballets Africains de Guinee, where he was not very well paid in the first place, all he received was a settlement of barely 1,000 German Marks. It’s even harder for him to talk about the poverty in his country, about human hunger and the corruption that hinders any sort of progress. Famoudou Konaté sends the money he makes through instruction and concerts home to his village, Sangbarala, because food is scarce there during the off-season. At the same time, he uses this money to support his family, which has since relocated to the capital city of Conakry. About 20 people belong to this family— his wife, children, and several relatives as well as one or the other person who was simply in need and taken into the household. But what really saddens Famoudou Konaté is that the only time there was any support of the arts worth mentioning was under the regime of the despot, Sekou Toure. Interviewer: Mr. Konaté, is there still some understanding for this musical tradition in your home country? Is it still cultivated there? Is it still taught? And practiced? Is it still alive in the villages? Konaté: There is this traditional music, and it is very much alive. You hear it played everywhere, and even in the villages that don’t have electricity, there are now people who get themselves a generator to create electricity. They hang lights on the trees and charge admission—not a lot, mind you, about 100 Guinea Francs—and they play disco music using electronic devices. Interviewer: But is there also a real cultivation of the tradition? Are there places where traditional music is taught? Are there universities like there are here with professorships for traditional music? Konaté: In the villages and the outback, of course, this doesn’t exist. In the place where I was born, this small village, that would be unheard of, because there aren’t many intellectuals there. The music is passed on when it is played. It is completely taken for granted. The people and the musicians who have heard this from early childhood simply know the rhythm “Soli,” they know “Balakulandyan,” they know the rhythm “Soko” and all the rest by name. The rhythms are in their hearts and minds and the dance is in their bodies. That is all there is, but there is no institutional transmission of information. North American workshop tour in 2000. Interviewer: What, then, is unique to the musical tradition of your people, the Malinke? Konaté: I have traveled throughout Black Africa and I’ve seen the white parts of Africa, too—Arabian Africa or Northern Africa, and I’ve studied the varying musical styles in these areas. These musical traditions are also very much alive. They play them for me and, for example, in Morocco, there is a rhythm that is very much like one of our rhythms—exactly the same tempo—but what is unique about our music is the melody. What is unique about the Malinke music is that this melody is created by the three bass drums, the largest of which is called “dundunba,” the midsized, “sangban,” and the smallest of the three, the “kenkeni.” The names are onomatopoetic reflections of the sounds each drum produces. The Malinke are the only people who work with these three bass drums. In addition, two accompanying hand drums each play a melody of their own and the djembe soloist improvises over the top. The accompaniment is strictly regulated and determined by tradition. The fine art is in the soloist’s skill. Konaté demonstrates here step-by-step the way this works on his drum using an audio sample from the song “Balakulandyan.” The second djembe accompaniment emphasizes the same pulse as the kenkeni drum. Then the djembe soloist enters the picture. There are six drums in total. Interviewer: Is the djembe a special drum? Konaté: Yes, the djembe is a very special drum, with a very penetrating sound that can be heard from a distance of as much as five kilometers without a microphone, without amplification, without anything. Interviewer: You say that you know over 80 rhythms. Do these rhythms tell stories? Do they have a meaning? What are they about? Konaté: I know even more rhythms than that. I know about 90 all together. But if I include other Guinean rhythms, there are still more. I’ll just pick a couple of random examples: there is the dance of the young women; the dance of the young men; a rhythm that isn’t for any one person in particular; there is the song of the birds and a mask dance—all the rhythms have a meaning. Interviewer: Mr. Konaté, when you teach the traditional music of your country here in Germany and in Europe, aren’t you just a little uneasy because this music means something entirely different to the people here than it does to you—that it is perhaps just an aesthetic rush for the people, a touch of the exotic, not the existential thing that it is for you? Konaté: To me, all the music of the world is a good thing. Whether it be German, Japanese or French, every country has its own culture. When I was young, European music was the only thing played in the major cities in Africa. We were in awe of this music back then. It was good for us. And if the Europeans devote themselves to African music now, we are very happy about that. Interviewer: But aren’t you a little concerned that you are being used as a kind of token representative? You are, after all, the only African musician that has been admitted to a professorship in this country. At the same time, the department that was dedicated to preserving this task, the Department of Traditional Music, has just been eliminated through budget cuts. Aren’t you a bit worried that you are serving as something of a small exotic token? Konaté: This is important. When I learned that the Department of Traditional Music was being closed, it wasn’t something I wanted to hear. Back when Guinea said to France, “Give us our independence,” the French gave us our freedom. Once we’d gained our independence, Sekou Toure, then president, called the tradition back from memory: the old music, the old songs, the old rhythms, everything that was traditional—and he did a good job organizing that. Up until then, the African women were really oppressed. No one had any respect for women. But when Sekou Toure took office, he put men and women on equal footing. Why should women be worth less than men? That is culture. And he changed that. Today, in my country, there are four weeks of the year in which each region has the opportunity to present its culture. Everyone participates in this event. There are traditions that had been lost. And you really have to be amazed at what Africa has to offer. The tradition cannot be lost. Announcer: Students at the Academy of Fine Arts in Berlin can consider themselves lucky because African Master Drummer Famoudou Konaté will serve as an honorary professor there starting the beginning of this month. Now, a special treat for all you drum enthusiasts out there. It isn’t easy to become a drummer—a good drummer, that is. You need to have that burning passion for rhythm in your blood. Of course, a lot of good drummers come out of Africa because this tradition has been fostered there for generations. Since the beginning of this month, one of the most significant master drummers from the world of traditional West African music, Guinean Famoudou Konaté, is an honorary professor at the Academy of Fine Arts in Berlin. Famoudou became a professor without ever having gone to school. While he does teach drumming in Africa, the old musical traditions there are passed on in the oral tradition and by hearing them played live. Konaté: I started playing djembe when I was a young boy, and I’ve played djembe all my life. It was my profession. Looking back today, at the age of 56, especially now, I realize that I never—neither as a child nor later— received a certificate or a degree or took any kind of test for my djembe playing. The president of the Academy of Fine Arts gave me this certificate, and this is the first paper of this nature I have ever in my life received. I am very, very proud of this award. Announcer: Professor Konaté is proficient in over 70 African drum-dances and plays the most significant drums, wind and string instruments in the traditional Malinke orchestra. 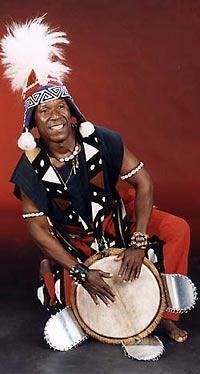 As a drum soloist, he accompanied the state-sponsored Ballets Africaines de Guinee on worldwide tours. In addition to his concert tours, he has been giving classes and workshops in Europe since the mid-eighties—certainly a challenge for someone who never learned drumming at the conservatory. Konaté: I was raised in a very musical atmosphere. My father was a successful farmer. He owned five big buildings in the village where our family lived with the slave population. In our family, and among the slaves as well, there were a lot of musicians. So I really grew up around the drums and music making. The Africans always surround themselves with music, and they absorb the rhythms as small children and grow completely into the music, but students here are accustomed to learning music through scores and notes. This is a big difference that also affects the way the music is taught. I notice again and again that the German students simply don’t know how to move to the music—neither when they’re making it nor when they’re dancing to it can they follow the music with their whole bodies. They are sort of like a tree that just stands there. Sometimes when I see European music on TV or in concert, it is completely removed from the physical experience. But European music has other qualities. That is a music that you can listen to quite well. There are beautiful melodies in it, but you simply can’t dance to a great deal of European music. Dr. Lilian Friedberg is a bi-lingual author/ translator and long-time drum student of Famoudou Konaté. 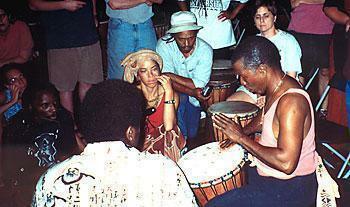 She is an instructor for the Chicago Djembe Project and holds an M.A. in Humanities from the University of Chicago and a PhD in Germanic Studies from the University of Illinois-Chicago, where she also served as Assistant Editor for The German Quarterly.